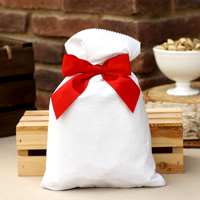 Our 2 lb Roasted & Salted Pistachios comes in a white holiday bag that can be customized with your logo, a saying, or image directly on the bag. The Holiday bags look great. Our Company logo was nicely placed and well done with a very professional look. Exactly what we were looking for.